DETROIT (AP) - The NHL-leading Detroit Red Wings are not getting any breaks to help snap them out of their funk. Rookie Devin Setoguchi scored midway through the third period after the puck went off the net over the glass. 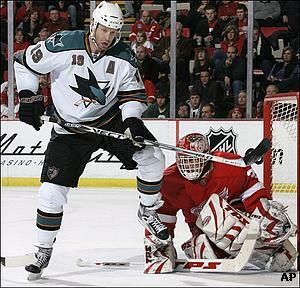 The goal proved to be the game-winner, giving the San Jose Sharks a 3-2 win Friday night over the slumping Red Wings. Detroit goaltender Dominik Hasek agreed. No one, in almost two decades, has seen the Red Wings struggle as they have recently. "I don't want to say there is panic in the room, but you can see disappointment on our faces," Hasek said. "But we still believe we can play the way we did before. Hasek also didn't want to blame rust for his lackluster performance, playing for the first time in nearly three weeks after being sidelined with a hip injury. "When you hold a team like Detroit to only 22 shots on goal, you've done a helluva job," Wilson said. Red Wings defenseman Niklas Kronwall played for the first time in a month, returning from a clavicle injury. He set up Zetterberg's power-play goal with a slap pass in the second period. Setoguchi deflected a shot off the net over the glass behind Hasek. The Red Wings disputed the goal, to no avail. "I know it popped up somewhere, didn't know where," Setoguchi said. "The next thing I know it comes down on my stick and I put it in." The rookie wing, recalled Thursday from the minors, scored for the third time this season in his initial game after being called up. "Every time we bring him up, he's a little bit more of a professional," Wilson said. "Let's hope he doesn't have to go back down." Detroit defenseman Brad Stuart, acquired from Los Angeles just before Tuesday's trading deadline, made his debut and provided the hard-hitting presence the Red Wings' depleted blue line needs. The Red Wings are without three key defensemen: Nicklas Lidstrom (knee), Brian Rafalski (groin) and Chris Chelios (knee). "We got the first goal and seemed to get the momentum," defenseman Craig Rivet said.